Faces are based on shapes.You can get a lot of variety from combining different shapes in your drawing. It’s always best to start with clearly defined shape for your head. globe, oval, cube, egg or pear shapes are you basic choices. For a normal adult front view face, draw an oval divide the width in fifths. Why? The width of your head is 5 eyes wide. Now divide it equally down the middle horizontally and vertically. This is your starting point to locate the other features. The horizontal line gives you the location for your eyes. The eyebrows and top of ears start usually an eye height above the eye. The bottom of the ears end at bottom of nose line. 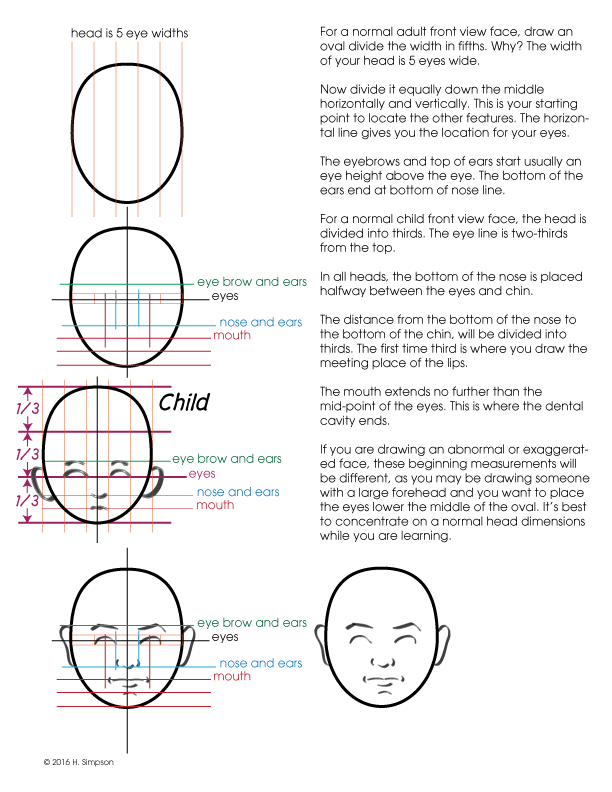 For a normal child front view face, the head is divided into thirds. The eye line is two-thirds from the top. 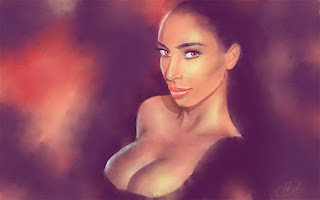 In all heads, the bottom of the nose is placed halfway between the eyes and chin. The distance from the bottom of the nose to the bottom of the chin, will be divided into thirds. The first two-thirds is where you draw the meeting place of the lips. The mouth extends no further than the mid-point of the eyes. This is where the dental cavity ends. 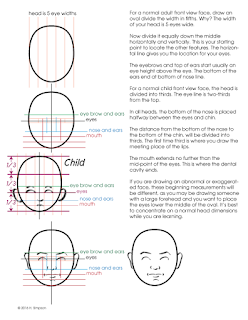 If you are drawing an abnormal or exaggerated face, these beginning measurements will be different, as you may be drawing someone with a large forehead and you want to place the eyes lower the the middle of the oval. It’s best to concentrate on a normal head dimensions while you are learning. Artist can develop what I call drawing glyphs. This is a shortcut method for drawing the same thing over and over to communicate to the audience. Your glyph for drawing a nose may be two lines or three lines. Using two or three lines don't make it a glyph. It's drawing those same style of lines for the nose on every face that makes it a glyph. This type of glyph doesn't fall into the stereotype or caricature category, it falls into the laziness category. Sadly, it may not be a conscious decision to be lazy. It sneaks up on you. It becomes a muscle memory. It goes beyond just your stylistic choices. It becomes what you perceive as way to communicate what a nose looks like and you know your audience will accept it. Beware of glyphs. More about glyphs here.